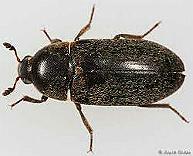 Adult DermestesThe council does not have a legal duty to provide a pest control service to control Dermestes beetles. Dermestes beetles are harmless, however, they can reach high numbers in a property where they have access to a food source. Dermestes larvae will eat anything of plant or animal origin as long as it is dry. The first thing to do when you find Dermestes beetles in your house is to carry out a thorough cleaning prior to calling out the pest control service. 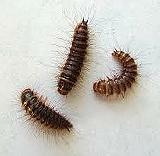 You may find both adults and larvae in your house. £33.90 (incl VAT) for a full treatment for those entitled to any concession. Non domestic properties are charged at £67.80 (incl VAT) for the initial visit then £71.07 (Incl VAT) per hour or part thereof for each subsequent visit. How quickly will we attend? We aim to attend calls within 5 working days. Do I have to do anything before the officer comes out? There are a number of actions you must take before the pest control officer attends to ensure the treatment is effective in the quickest possible time. Thoroughly vacuum the carpets/floors throughout the house and discard the contents of the vacuum cleaner in the bin outside. Make sure there is no food debris lying around the floor. Please ensure there are no pets in the house at the time of our visit. Please let us know if you have fish tanks in the house as some insecticides are fatal to fish. What are our working hours? For the initial visit, we offer a choice of either 08:00 - 12:00 or 12:00 - 16:00 Monday to Friday. After the initial visit you may agree a revisit with the officer attending out with these hours but we cannot guarantee this will be possible. We do not work over the weekends or on public holidays. Dermestes beetle treatments may take more than one visit although this is rare. The insecticides used have an active life of six weeks and will protect you for this time as long as they aren't mopped or cleared away. After treatment you may observe beetles and larvae for a short time as there is no treatment which will kill of either the eggs or pupae and they have to be allowed to hatch for the insecticide to have an effect. Do you carry out any works to stop future infestations? No. There is no way to ensure you will not get Dermestes beetle in future years although maintaining a high level of hygiene will ensure that any infestation is kept low.